What with all the emails begging me to fix the multitude of wrongs on the earth with a handful of clicks and the Facebook posts admonishing me to live my life to the fullest by being here now (thus leaving my inglorious past behind me), I utterly forgot that Sunday was Be Kind to Your Vacuum Cleaner Day. To be precise, it was Sunday evening at 9:30, because that’s when I celebrated it. Sure enough, their bags were pregnant with dust and cat hair and all the other stuff that falls silently onto the carpet. As I removed those heavy loads of domestic flotsam, each containing at least a year’s worth of dust, I heard both machines breathe a gentle, easy sigh. Their motors relaxed. While I was at it, I replaced their weary air filters, gave the roller brush on the upright a haircut, and wiped the dust off their shiny bodywork. Mine are Mieles. They’re from Deutschland. And though they are tough and long-lived, they may revolt if I fail to obey the rather rigorous maintenance schedule outlined in their commanding owner’s manuals. Therefore, ACHTUNG! 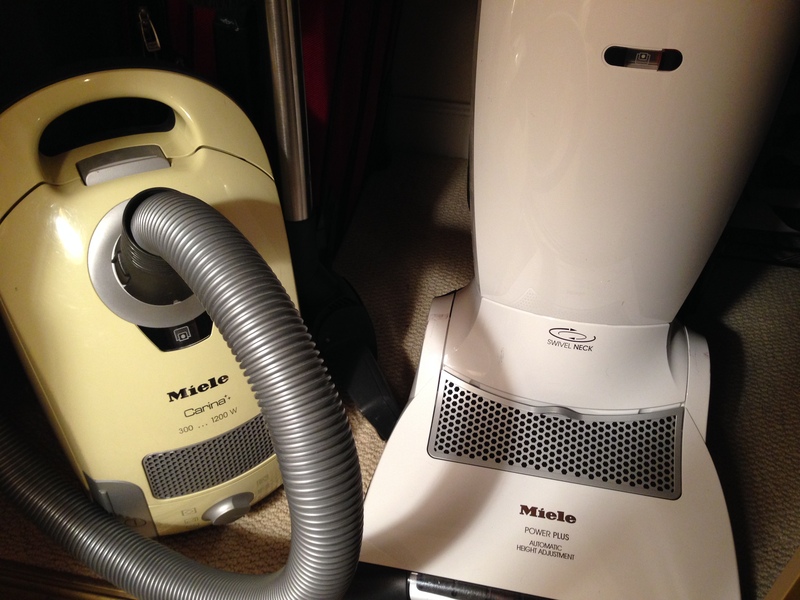 Change der bag, und unschtoppen das hoses, unt use only der genuine Miele filters! Your vacuum, in an easy, thorough and neat fashion, performs a task even the most adroit human hands cannot, quickly collecting invisible bits of dust and containing them in a handy, impermeable enclosure. Many used to wash their clothes by hand at the river; we could return to that if all the washing machines got out of balance and trundled away. But just try doing what your vacuum does. You will fail—or you will go stark raving mad. I guarantee it. So no matter from what great land your vacuums hail, whether they’re humble Kenmores or the once-proud Hoover, remember February 8 at 9:30pm is the most auspicious time to reward and honor them with a little tender loving care. Dust is the enemy we all must confront. We dare not rest.